We do not curently have theatre tickets available for The Commitments. This could be because we have simply sold out or it could be that this show is no longer running. The information on this page remains purely for historical and informational purposes. First it was a best-selling novel, then an international smash-hit movie that spawned a chart-topping band. Now Roddy Doyle's classic story of a motley bunch of Irish kids who find salvation through soul music comes to the stage for the very first time. 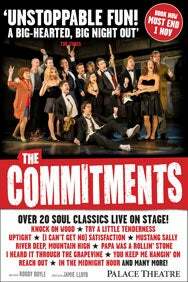 More than two years in the making, this musical take on The Commitments has been adapted from the novel by Booker Prize-winning author Doyle himself and energises and inspires like never before. Rest assured that your favourite sixties soul blasters Mustang Sally, Mr Pitiful and a host of other classic numbers feature front-and-centre. It's directed by Jamie Lloyd, whose most recent success was the sell-out Trafalgar Studios production of Macbeth starring James McAvoy. Experience the sparkling, power-packed Commitments musical on its world premiere run, featuring a super-hot young cast. (5mins) Take Charing Cross Road until you reach the crossroads with Shaftesbury Avenue.